While everyone loves being indoors in air conditioning on hot summer days, indoor spaces sometimes could use a good pop of plant life. Plus, Mother Nature has her own way of cooling things down. Try cooling your house down the eco-friendly way with houseplants. Not only do our favorite houseplants look good, they also have humidifier properties and clean the air too. If you live in dry regions, having houseplants with humidifying effects will help beat the heat. Not only will you be able to treat sunburns all summer, but Aloe leaves have a high water content which release cool moisture into the air. Aloe is also known to remove toxins from the air. The plant prefers a lot of sun and well-draining soil, such as Espoma’s Organic Cactus Mix. Water approximately every three weeks to allow the soil to dry 1-2 inches between watering’s. 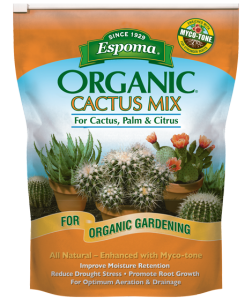 Fertilize once per month with Espoma’s Cactus! Liquid fertilizer. The bamboo palm’s luscious leaves are excellent humidifiers and have air purifying qualities as well. The more mature the plant gets, the more moisture it releases. Bamboo Palms prefer well drained soil and pots. They are relatively low maintenance and only require watering when the soil surface feels dry. It is important not to over water Bamboo Palms. Set the pot in an area with bright, indirect light to get healthy growth. Sansevieria has a variety of names but is commonly known as “snake plant.” This snake-like plant has incredible air cooling and cleansing properties. Not to mention, it may be the easiest houseplant you can find. It only requires watering when the soil is completely dry. This can take up to six weeks depending on the size of the plant, humidity, light and temperature conditions in your home. They prefer indirect, medium-to-low light. The Peace Lily is a home essential. Not only does it have stunning green foliage, but if given enough light, classic lily blooms will flower. They have air cleansing and cooling abilities making them perfect as part of your air-cooling house plant team. Peace lilies prefer medium to low light and well-drained soil. For quality potting soil and houseplant success, try Espoma’s Organic Potting Mix. The biggest danger with Peace Lilies, and most plants, is over watering. It is best to check the soil once per week. If the plant starts to wilt or the top 1” of the soil is dry, it is time to water. They only require fertilizing once or twice per year. Like the other heat-battling, air-cleansing plants on this list, the Areca Palm tree is an excellent air humidifier and also removes toxins from the air. It requires a little more attention than the other plants on this list and will not survive neglect. They prefer lightly moist soil so be sure to check on your plant frequently, especially in warmer temperatures. It is best to fertilize frequently in the spring. For a lush, healthy tree try Espoma’s Indoor! Liquid Fertilizer. They are light-loving plants so near a non-drafty window would be the perfect spot. Find out how Summer Rayne of Homestead Brooklyn cares for and fertilizes her houseplants. Summer is using Espoma’s Indoor! liquid fertilizer. Laura from Garden Answer shares her tips for caring for Fiddle Leaf Figs. This “it” plant is loved by designers and decorators for it’s large, violin-shaped leaves. Give fiddle leaf figs everything they need to continue growing healthy and strong year-round. Visit our YouTube Channel for more gardening videos. After months spent overwintering or dormant, your houseplants are ready to welcome spring with open arms and begin their active growing period. Houseplants are easy to care for but they still need some TLC. The warmer weather calls for some extra attention! Gear up for repotting, feeding, sunning and scheduling. Make a happy home for plants with the following tips. Here’s how you do it! Rehome and Repot: When repotting plants, we recommend using a new container that’s a little bigger than your plant’s current home. If you choose to use a previously used container, clean it with soap and water first to rid of any diseases or houseplant pests that could be hiding inside. Once your container is ready, fill it about halfway with Espoma’s potting mix or appropriate soil for your plant type. If any of the roots have grown tightly bound in a circular pattern, gently loosen them to stimulate new growth. Then, place the plant in the center of the new pot and fill with soil to within 1-3” of the rim. Water well and allow the soil to settle. Add more potting soil if necessary. Give Houseplants a Spring feeding: There’s no doubt that your plants are hungry after a long winter nap! Feed bi-weekly with Espoma’s indoor liquid houseplant food. This gives plants the natural proteins and beneficial microbes they need to provide beautiful results. Bring Plants Outside: Give plants some fresh air once in a while. As it warms up, set your plants outside during the day to soak up some rays. When the temperatures begin to drop in the evening, it’s time to bring them back inside. Create a schedule: Houseplants thrive with regular care. Add water if the soil is dry to the touch. But be careful not to water too much or too frequently. Overwatering is the number one cause of houseplant death. So if the is not dry to the touch, check it again in a few days. In order to protect your plants from not getting the right about of water, create a schedule of watering times and days to help you remember when your plants need your attention. Plants need water, light and nutrients to thrive indoors. So, determine what kind of houseplant you have and it’s specific needs. With the proper care, your plant will let you know it’s happy by maintaining healthy leaves. Ready to learn more? Find out how to Make a Happy Home for Plants! Orchids make the perfect houseplants — they’re stylish, long-lasting and easy to care for. They’ll continue to bloom for years with minimal effort. After years of living in the same space, things might get cramped. And the same can be said for your moth orchid. Refresh your orchid – and let it spread its roots – by giving it a new home and repotting it. Orchids generally need to be repotted once a year. The best time to repot is just after flowering, or when new growth appears. Your orchid has tightly tangled roots. It’s normal for Phalaenopsis orchids to have loosely tangled roots. This is a surefire sign your orchid needs to be repotted. Give plants breathing room by placing it in a larger pot every year or two with fresh potting soil. It’s been a while since you’ve repotted. Orchids need fresh potting mix every year or so. This continues to provide plants with the best nutrients and encourages proper air circulation. Soil that is not replaced can retain more water, leading to root rot and leaving your orchid vulnerable to fungal diseases. Your orchid’s roots are soft and brown. If you truly waited too long to repot, you’ll notice that your orchid is holding too much water. The roots will appear brown and feel soft to the touch. Fresh orchid potting mix will provide your plant with the environment it needs to stay happy and healthy. Think it’s time to repot? Follow the steps below to give your orchid the space and soil it needs to keep growing happy and healthy. Choose the right medium. We suggest using Espoma Organic Orchid Mix. For best results, pre-soak orchid mix for 24 hours and allow water to drain. Remove orchid from current container and trim dead roots from the plant. Gently cover roots with additional mix and fill pot to 1/2 inch below rim. Water thoroughly. Add more mix if setting occurs. Is your orchid telling you it needs to be repotted? Watch this video to learn how! The winter season can seem to drag on forever with its harsh weather, short days and dreary landscapes. Which means now is the perfect time to bring the memory of the warm spring weather indoors with houseplants. January 10 is Houseplant Appreciation Day, and there’s no better way to celebrate than to acknowledge all the things they do for you. They’re decorative, boost well-being and purify indoor air. Many houseplants do double duty by looking good and cleaning the air, absorbing up to 87 percent of volatile organic compounds (VOCs) that hide in ordinary household products such as paints, carpets and ink. Studies from the US Environmental Protection Agency (USEPA) have found that levels of indoor air pollution can be two to five times higher — and in some cases 10 times more polluted than outdoor air. You can never have too many houseplants, right? According to the EPA, most people spend 90 percent of their time indoors; a houseplant is the perfect way to be reminded of the beauty the world has to offer outside. Houseplants bring a breath of fresh air to a room when placed in colorful pots and made into a focal point. Succulents, orchids and African violets all make good additions. Plants need water, light and nutrients to thrive indoors. Step one; determine what kind of houseplant you have. This can be as simple as checking the plant tag. Your plant will let you know it’s happy by maintaining healthy leaves. Houseplants do best with regular care, trust us. Now is the time to create a watering schedule if you don’t already have one. Add water if the soil is dry about an inch below the surface. Overwatering is the number one cause of houseplant death. So if the plant does not seem too dry, check it again in a few days. Fertilizing is easy with Espoma’s indoor liquid plant foods. Give plants the natural proteins and beneficial microbes they need to provide beautiful results. Show gratitude for your favorite plants by giving them proper care. Learn how here. With the start of a new year, we’ve got resolutions on our mind. Eat right, exercise more and add houseplants. Yep, you read that right. Houseplants actually boost your wellbeing. In addition to bringing the outdoors in, some houseplants are proven to provide both physical and psychological benefits. You know that plants produce the oxygen we breathe, but did you know that houseplants are also powerful natural air filters. Common products such as household cleaners, carpets, furniture and nail polish release volatile organic compounds (VOCs) into the air. Add just few plants to your home to improve air quality. Adding houseplants is one of the easiest and least expensive ways to make your home healthier for the New Year. Winter houseplants aren’t just limited to holiday plants like poinsettias. The options are endless. Some houseplants even remove common toxins from indoor air, surely shooing away the winter blues. Other scientific studies show houseplants can help us stay healthier in other ways, including reducing frequency of headaches, sore throats and stress levels. Especially after spending so much time indoors for the winter, it’s nice to have a pop of nature. Dry skin and chapped lips are uncomfortable side effects of forced-air heating. A natural remedy is to add houseplants that act as humidifiers, releasing moisture as a part of their natural breathing. Being around plants, especially in indoor environments, improves creativity, problem-solving skills, memory, and cognitive skills. While you’re at it, don’t forget to keep houseplants healthy! The cold season can be challenging for houseplants, too. Help houseplants thrive by creating a happy home and they’ll continue brightening winter days. Feed with Espoma’s indoor liquid plant foods to give plants the natural proteins and beneficial microbes they need. And the innovative Easy Dose cap pours the perfect amount without any measuring or mess. Houseplants give back year-round. Learn more about caring for houseplants here. Lush green plants filled with blooms aren’t only found in the garden. Even though you’ve put your outdoor garden to bed for the winter, you can still grow thriving houseplants inside. Winter houseplants aren’t just limited to holiday plants like poinsettias. The options are endless — ranging from African violets to orchids. Some houseplants even remove common toxins from indoor air, surely shooing away the winter blues. The cold season can be challenging for houseplants, however. Light is low, days are short and indoor humidity is terrible. Help houseplants thrive by creating a happy home and they’ll continue brightening winter days. Keep leaves green. If leaf tips are brown, it means your houseplant isn’t getting enough moisture. The remedy is simple. Place a humidifier near multiple plants or place the plant on a tray of pebbles and water. But don’t let the roots sit in standing water. Don’t forget to water. This is a common issue for the forgetful gardener. Set up a watering schedule and give plants a drink when soil is dry to the touch, about every seven to 10 days. Let in the light. A houseplant will tell you it’s happy by maintaining healthy leaves. If there’s enough light for you to read by, there’s probably enough for a low-light houseplant. Don’t put plants near heat or air conditioning ducts, on TVs, or between curtains and chilly windows. Feed Organically. Fertilizing is easy with Espoma’s indoor liquid plant foods. Give plants the natural proteins and beneficial microbes they need to provide beautiful results. And the innovative Easy Dose cap pours the perfect amount without any measuring or mess. Brown thumbs can easily turn green. Learn more about caring for houseplants here. There’s so much to love about the holiday season — the cooking and baking, the time spent with family and friends, and the festive plants. Poinsettias or a blooming Christmas cactus are compact yet boast of holiday spirit. The more plants, the merrier! With just a little care, holiday houseplants can continue to thrive throughout the year. Knowing how to care for them helps to keep them beautiful. Repot later if needed. So whether you’re getting or giving holiday houseplants, use these tips to help keep them blooming. Poinsettia: No other plant quite marks the beginning of the holiday season like the poinsettia. With more than 100 varieties available today in colors of red, white, pink and more, this plant can be found just about everywhere during the holidays. First things first, don’t let poinsettias get cold on the ride home from the store. Keep trips and exposure to cold as short as possible. Once home, these cheery plants thrive on six hours of indirect light a day away from cold drafts and need proper watering. When the plant needs water, remove the decorative foil and let soak in a few inches of water for an hour or so. Let excess drain and rewrap. Tip: Take the poinsettia out of its foil and place it in a decorative container. Norfolk Island pine: A mini Christmas tree, this festive plant looks lovely when adorned with mini lights and homemade ornaments or just plain on its own. Give pines about six to eight hours of light per day. Any less and lower branches are likely to drop. Water when dry to the touch. Fertilize Norfolk Island pines bi-monthly with our new liquid houseplant fertilizer to keep them happy and healthy. Tip: Pines can last for years and be decorated for other seasons as well! Christmas cactus: Though this cactus is known for blooming around Christmas, it’ll stay strong throughout the year and periodically rebloom. It’s ruffled flowers range in color from reds to pinks to oranges and creams. Give this plant bright indirect light and place outdoors in a semi-shady spot during summer months. Allow plant to become slightly dry between waterings. Keeps this holiday plant reblooming for years to come by giving it a rest during the fall and placining it in the dark for about six to eight weeks, encouraging new blooms. Tip: No matter how diligent you are about care, bloom time may vary based on variety. Whether or not it blooms in time for the holidays, you’ll still have winter blooms to enjoy. Cyclamen: Cyclamen’s bright flowers in pink, white or red are great for adding a pop of color where you need it. With the right conditions, they can bloom for more than eight weeks. Cyclamen likes light, but not super-bright light. Keep the temperature consistent and deadhead spent flowers and leaves. Pour water in a saucer and let the plant absorb it for 15 to 20 minutes. Tip: During the summer, cyclamen’s foliage turns yellow and dies back. This is their dormant period when they’re storing energy for the next flowering season. Any houseplant can grow with the proper care. Learn how here.